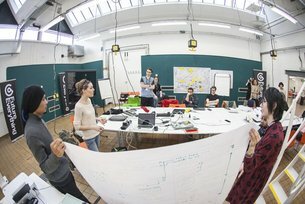 What happened when ten innovators from around the world descended on Manchester for the Global FutrLab? We lift the lid on this unique global experiment. LABORATORY. 1 a : a place equipped for experimental study in a science or for testing and analysis; broadly : a place providing opportunity for experimentation, observation, or practice in a field of study. To help celebrate the 20th Anniversary of Manchester arts/ tech/ ideas mash-up FutureEverything, we brought together ten extraordinary young people working to make the world a better place. Our Global Futr Lab participants were diverse in terms of origin, practise and ideas; we were interested in what alchemy would take place when these innovators were brought together to engage with each other and FutureEverything. What can a sound artist from South Korea share with a creative entrepreneur from Nigeria? What lessons would the founder of a energy-saving startup from Ukraine learn from a smart cities platform developer from Pakistan? How would the founder of a UK hack “circus” respond to being challenged by a “hacktivist” from Indonesia? Unlike other “hackathon” projects, the output of this Lab wasn’t a physical product or a brand new idea. The outputs were the journeys the participants took as a result of bring incubated in a open, suportive, shared space. This was where they could take a step back from their everyday lives and use the unique perspectives of other global creatives to test, critique and challenge their own work. Curating quality time for people who share similar visions but are products of very different cultural contexts was this Lab’s USP. The Lab was facilitated by research company Strange Telemetry, who kicked off the two day experience by introducing our international pioneers to an alternative view of Manchester, one which highlighted the city’s resilience in the face of post-industrial change. Our innovators took a walking tour around the city to see some examples of how the city has responded to changing demands from its citizens and conflicts between public and private spaces. Back in the Lab, the group started thinking and talking about their own work and how shifting local, national and global demands might affect their own systems and futures. How resilient would a web-based business model be if access to the web was limited by government? How much of their work relied on the a steady stream of open data? How would they cope with some of the disruptions faced on a daily basis by some of the other Lab participants? The Lab was designed to pose some big questions, but our Innovators don’t have to find the answers on their own as they are now part of a global network which can keep questioning, testing and supporting each other throughout the year. And it's fair to say that the participants of The Lab left an indelible, even inspirational impression on each other. Caroline Meaby is Global Programme Manager in the Creative Economy team. Read Global Futr Lab participant Bhavani Esapathi's accaount of her week here. Being part of our international collaboration projects can have a profound effect on participants. Leila Johnston reflects on how Global FutrLab shifted her view of the world - and herself.